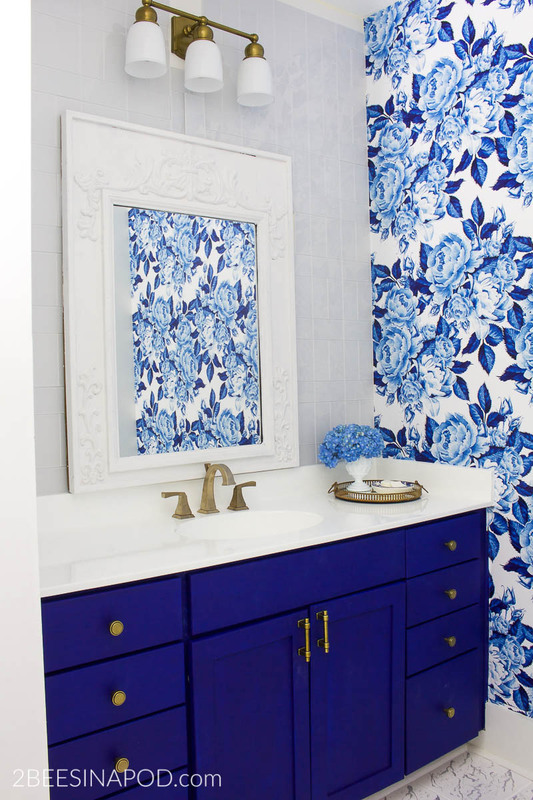 Room makeovers don’t need to break the bank. 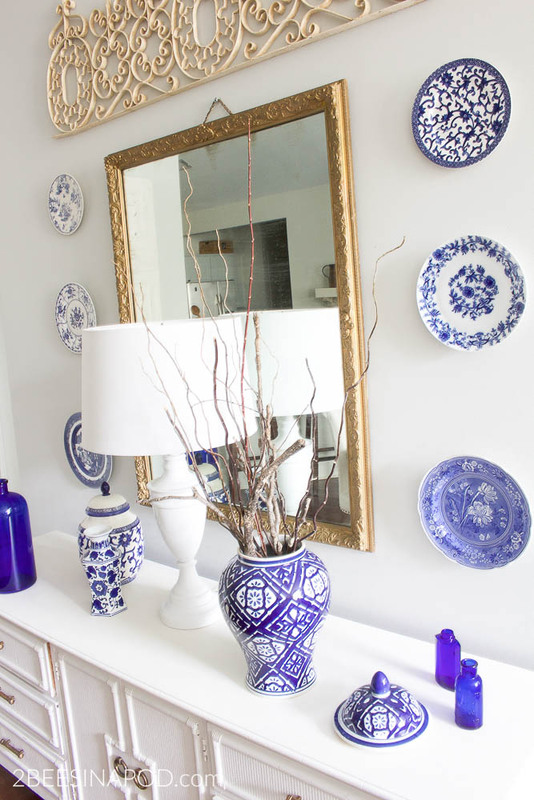 This is a budget friendly dining room makeover. When I decided to do the kitchen makeover I knew that the dining room would need a little refresh too. Other than the countertop bar area, the kitchen does not have any dining space. Being that the dining room is practically inside the kitchen, I felt an update was needed. 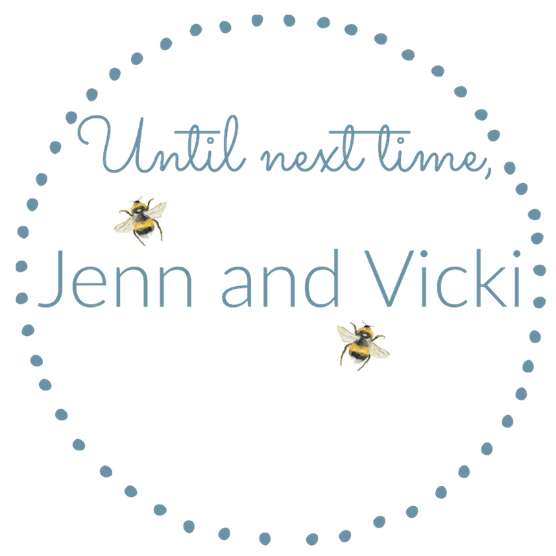 Since moving into this house nearly two years ago (GULP, has it already been that long) I have been infusing my style bit-by-bit, room-by-room. This was quick, easy and most importantly a budget friendly dining room makeover. 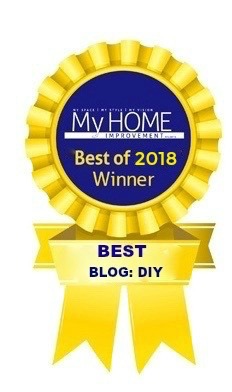 If you have been following the blog for awhile, then you have already seen the dining furniture makeovers. 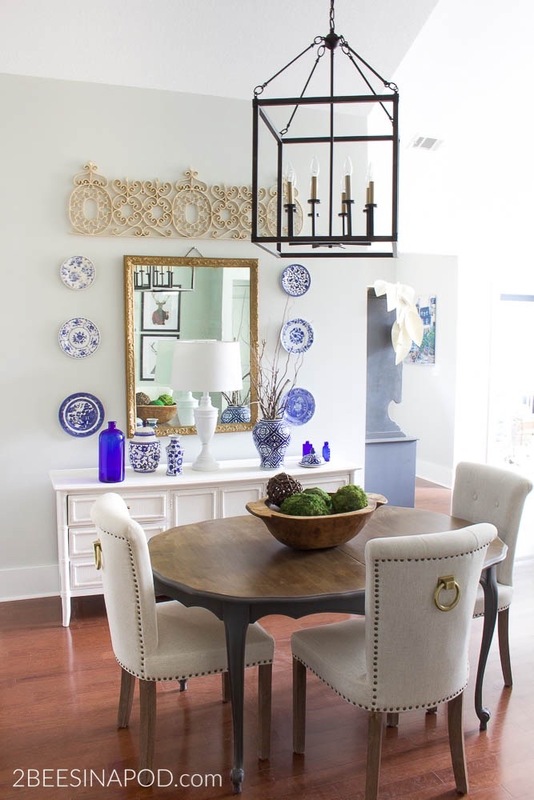 The painted sideboard buffet and the dining room table were very inexpensive vintage pieces of furniture that have literally given personality to the room. 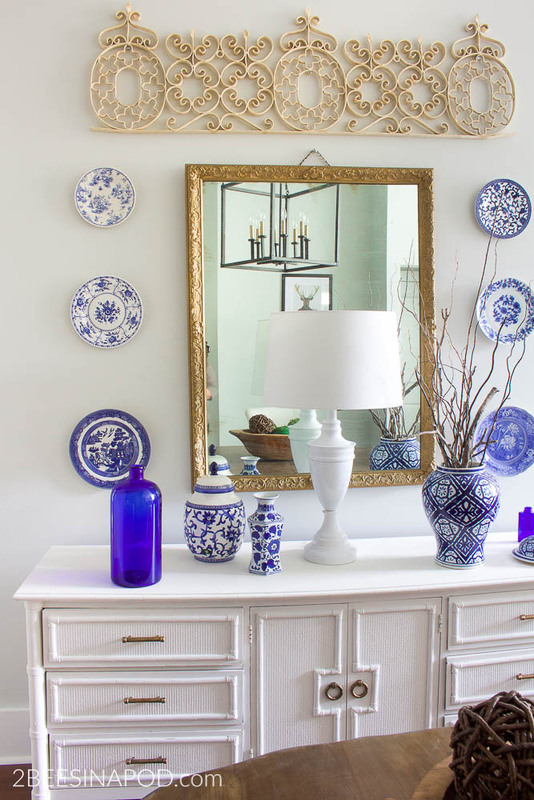 Being that I love blue and white in my home decor, it is no surprise that I would also use this classic color combination in the dining room. 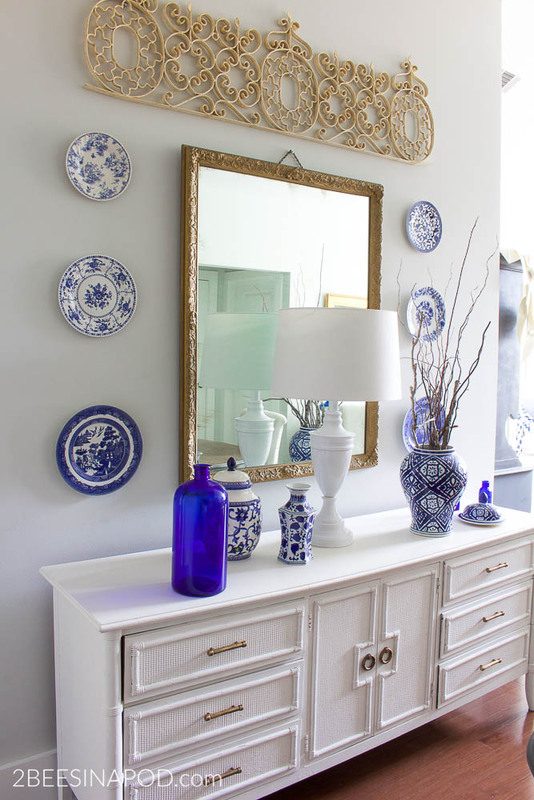 Vintage cobalt blue bottles and chintz ginger jars are displayed on the sideboard. 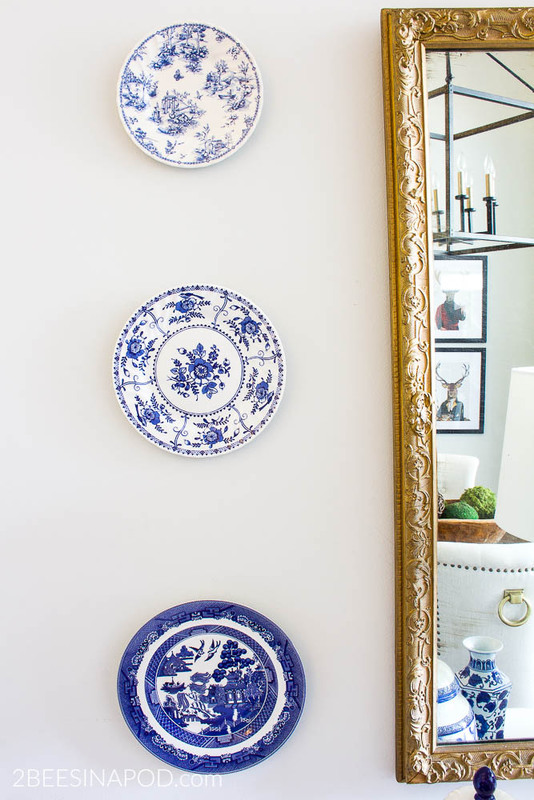 Mismatched china plates are hung on the wall next to an antique mirror. This antique mirror hung in our previous home and until recently and had been collecting dust in the garage. 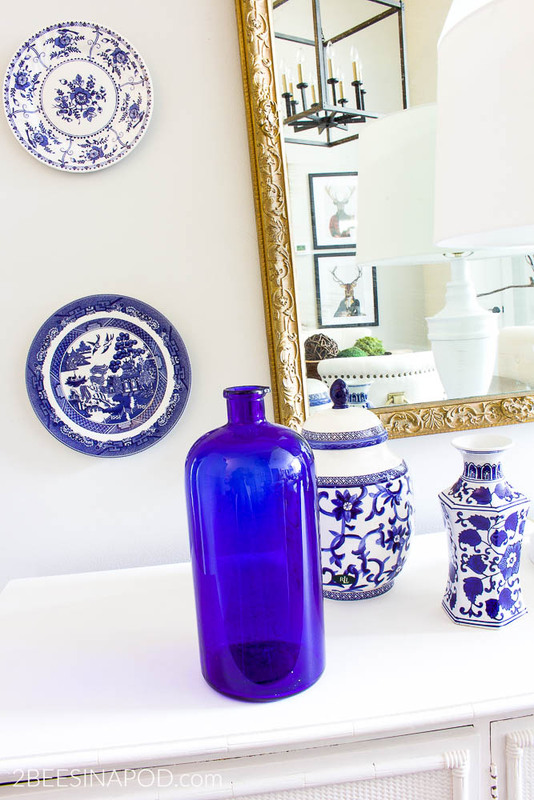 I just knew that the mirror would be the perfect center-stage statement piece on the wall. The only new purchase to the room is this beautiful new Cayden light fixture. It is large and gorgeous! Above the mirror I hung this ornate iron gate piece that I just took down from above the master bedroom headboard. Yes, things are changing all around the house LOL. Adding sticks from nature gives this area a bit of life. The lamp was also a makeover project. It’s hard to believe that it used to be a brass lamp. There is an awkward, small wall that also has a thermostat attached to it. 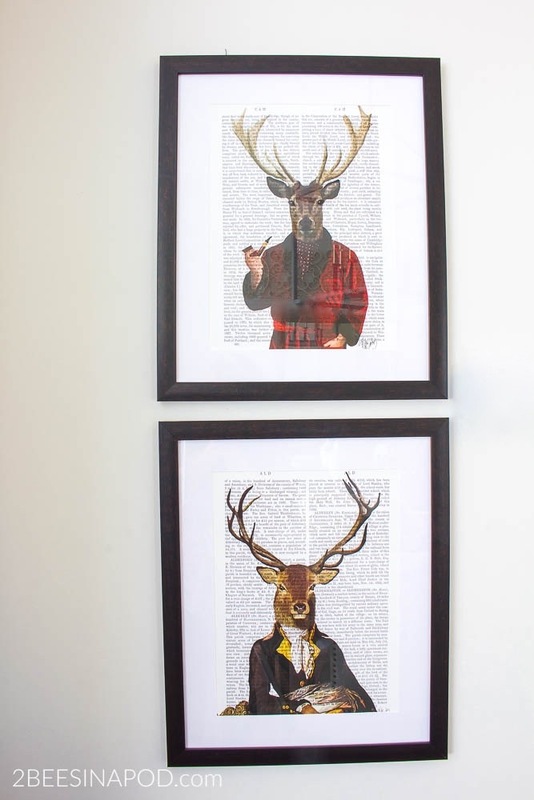 For now I have this distinguished pair displayed. I have lovingly started calling them Suave and Debonair. Here is a better view of the china patterns. Most of these were inherited pieces. 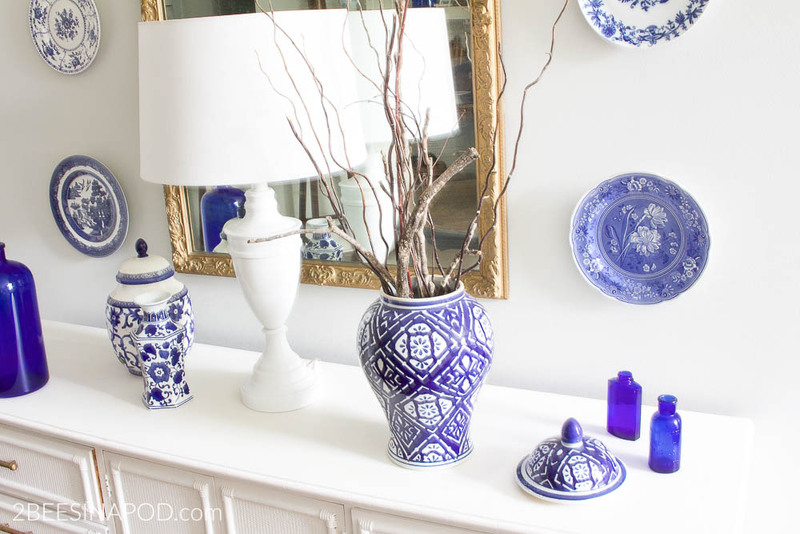 This cobalt blue bottle is an antique apothecary jar – another family gem. I hope you like my budget friendly dining room makeover. 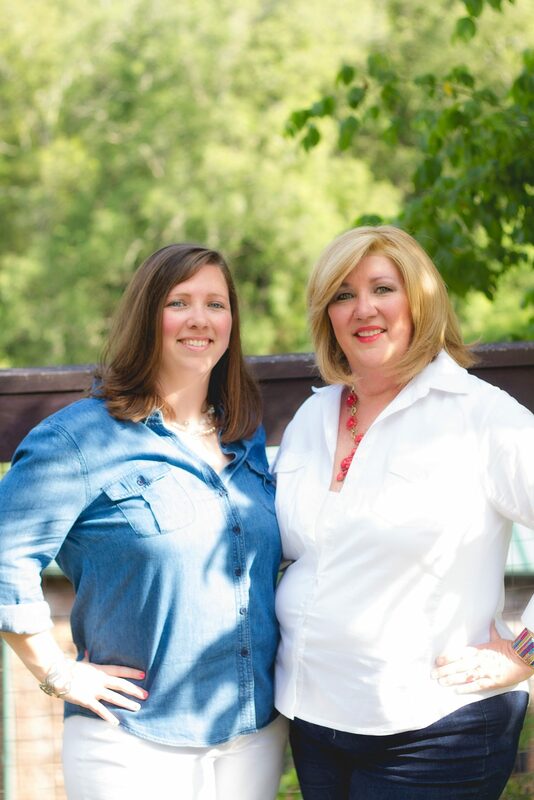 Also…a big Congratulations to our Thrifty Style Team giveaway winner Nadya Kotik! She won our antique egg cups! 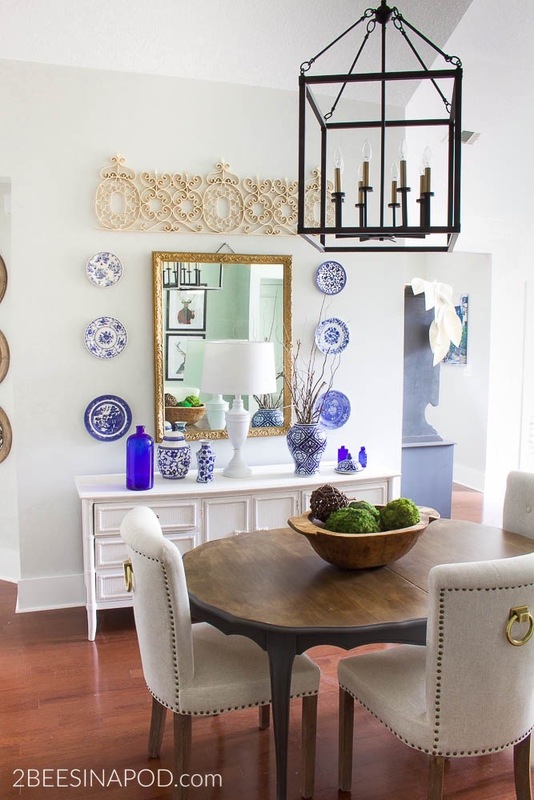 Wow, your dining room looks terrific…so fresh and ready for spring. I love the new chandelier. Happy Easter! 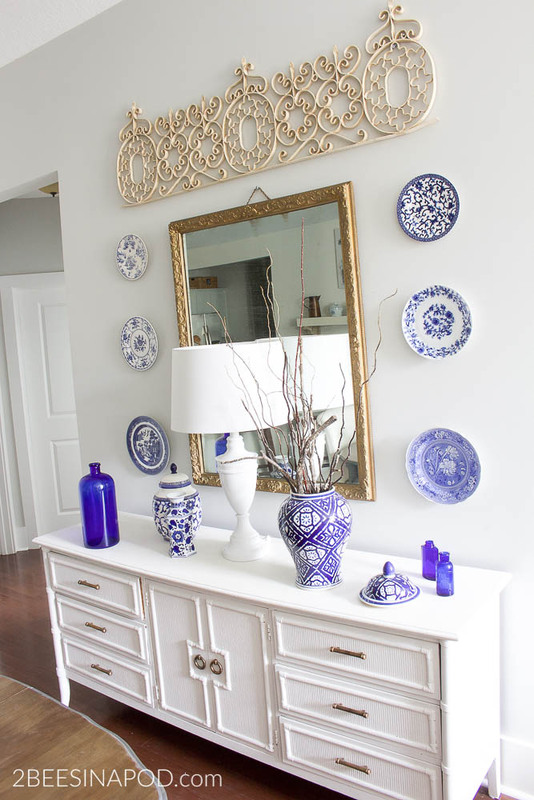 I am in love with blue & white! 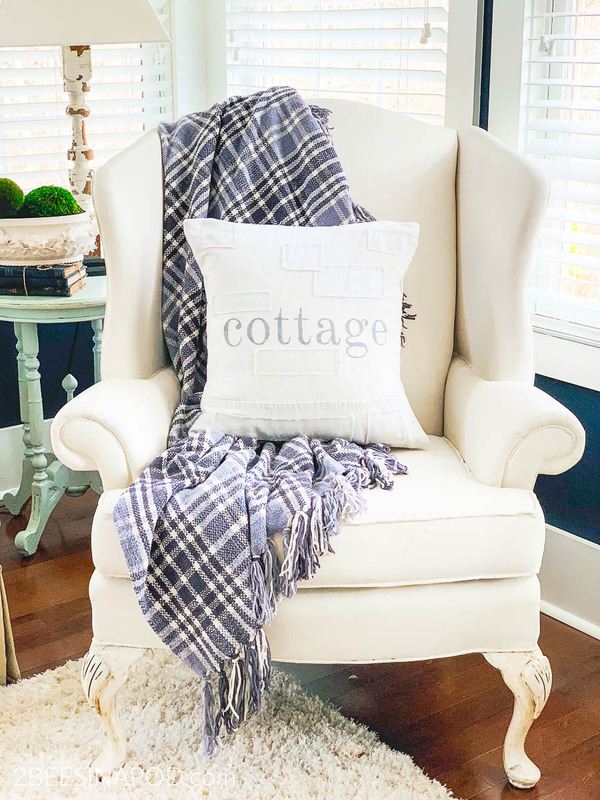 I bought a blue/white print planter and added it to my white wicker seating area on my screen porch, a touch of a green plant was needed and I think I would add that to your dining room, too. 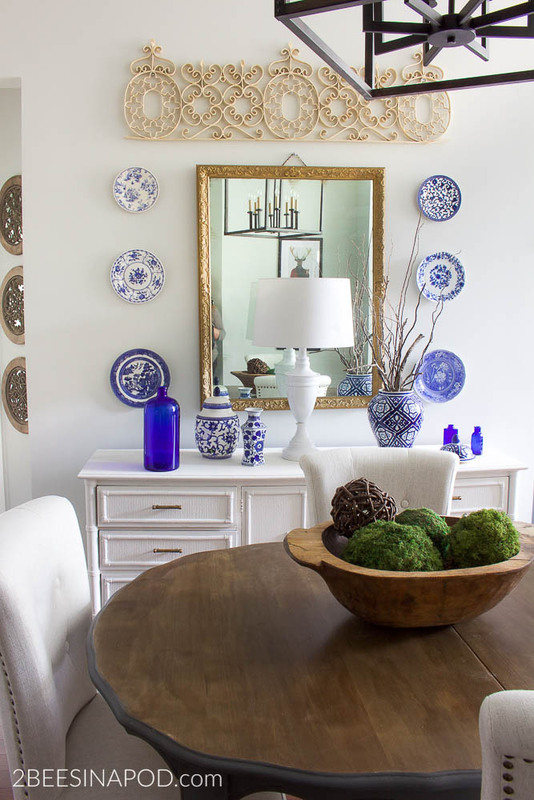 Wow, your dining-room looks excellent … prepared and so fresh for spring.